Do you ever hear little voices in your head? I’m serious. Do you? Or am I the only one who daily wrestles with voices that vie for my attention? The voices bicker about my physical well-being throughout the day, arguing about how much water I should drink, what snacks I should or should not eat, and the size of my meal portions. They fight about other matters, too. Here are some recent examples. “God has never failed you and He won’t start now. He dwells in the praises of His people, so open your mouth and start praising Him for who He is!” (BTW—the necessary funds for the trip arrived on departure day. We’re still trusting Him to supply for the monthly shortfall). “Trust and believe. Get up and go, and God will strengthen you for the task He’s called you to do.” (I listened to this voice and experienced God’s strength to travel to and from the church by taxi—not a comfortable feat there—and to stand to preach for 40 minutes. By the next morning, my health was completely restored and I’ve felt fine ever since). Every day, many times a day, I hear these voices. One plants seeds of doubt and discouragement. The other speaks truth and hope. I must tune my ear to listen well, to identify the source, and to respond accordingly. 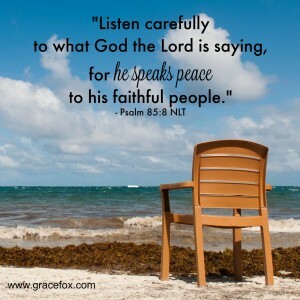 Psalm 85:8 says, “Listen carefully to what God the Lord is saying, for he speaks peace to his faithful people.” The enemy of our soul whispers lies bent on our destruction, but the Holy Spirit speaks words meant to strengthen and encourage us. Listen well, my friend. Learn to discern. And heed the voice that speaks peace and life. So—am I the only one who hears little voices throughout the day? Or do you hear them, too? 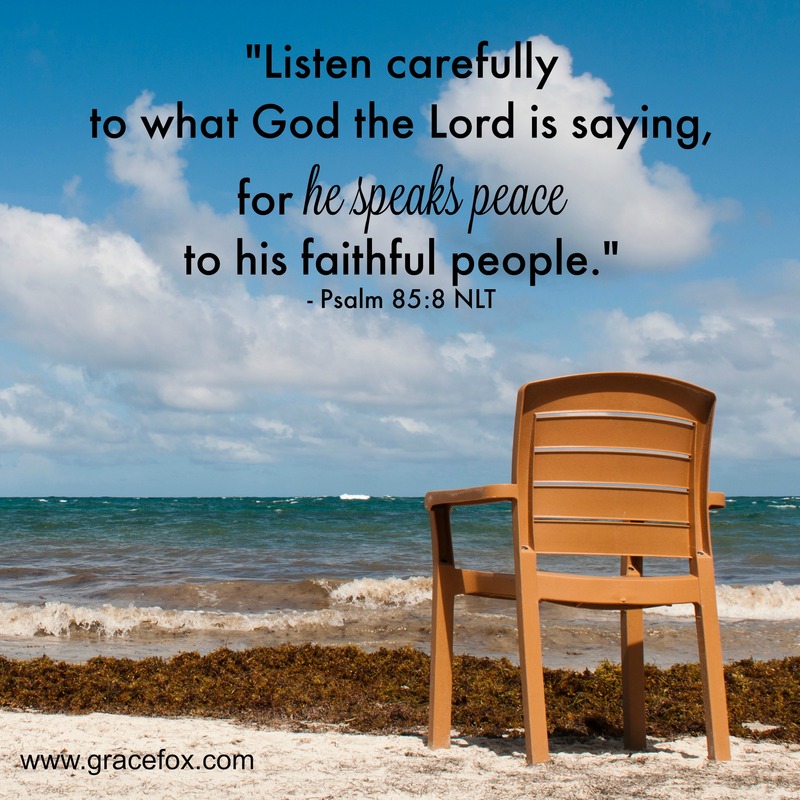 Share some examples with us, and tell us how the Lord’s words have spoken peace and life to you recently. You’re certainly not the only one, Grace. I hear it from nearly everyone I know, but I am now in the practice myself of, “Taking every thought captive by the Blood of Christ”, because those negative little thoughts for me usually are: “Just ignore her, she deserves what’s happening to her, because of………….”; or “He deserves to die; he doesn’t even enjoy life”; or “Look at those neighbours and how they live!” But I choose to pray for them, as I am living to please my Father God, and not the devil and his cohorts, or myself. I want to honour God with my life and words and thoughts (even though it’s a continuous challenge), and we need to stay in his Word. and give thanks daily. I have those thoughts that say: “You’re so fat!” “You’re lazy!” “You don’t do as much as other women of God”. But, those are lies…….the Satan is the father of lies! and he has no place in us!!!!! Hallaluyah! We are children of the most High God, and he loves us with a never-ending love. We can do nothing to get him to love us more, and nothing can take away the love he has for us, for his love is perfect and we already have his love. Yes, and he speaks Peace to his kids! Praise Him. We pray blessing on you and your household and ministry, in every area of your needs. Marge, I just love your transparency. And your wisdom. And your willingness to share it with the rest of us. Know you are loved (and that’s the truth!). I hear them too! Ugh! But learning to take the negative captive. Just today I was feeling pressure to perform.. pressure of high expectations I could not achieve. I asked for prayer.. and afterwards.. they were all gone and I could continue to work and be, in peace and joy. Sometimes we need that little extra help – prayer. Sometimes we can deal with those “voices” with God’s help, on our own. Thanks for stopping by, Christine, and for sharing your thoughts. You’re so right about how the Lord speaks to us. Loving, patiently, gently. Accusations and shame and blame are not from Him. BTW–you did a great job yesterday! Can’t wait to see the pictures.